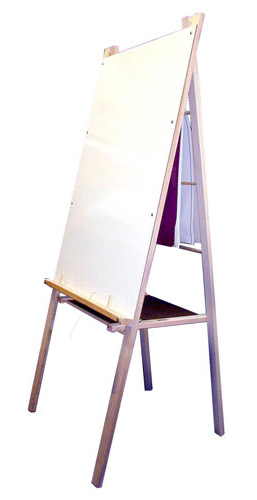 * This single-sided easel has the same great features as our Big Book Easel; it's just talle. * Our Teacher's easel is perfect for use by adults, as well as children wanting a large art surface to explore. * Beka's Teacher's Easel is a great option for use in tight spaces since it folds very easily for storage. * 57 1/2" high, with a 24" wide x 36" high white wipe-off marker board art surface. * The easel's back features a series of dowel rods useful for hanging books or art projects that need to dry!.